Appointments – Taylor Denture Clinic Ltd. Following the steps below will ensure you enjoy a seamless, stress-free experience, from your initial consult right through to your final fitting. Call our office at 1 (306) 585-0333 to schedule your appointment. Please let Darcy know what kinds of service(s) you are booking in for, and don’t hesitate to ask questions about our process. Your questions help shape the way we provide our services. We encourage you to bring any questions you may have about replacing, relining, or repairing your denture to your appointment. We are happy to provide answers and options! Arriving on time ensures you maximize your time with Brian. 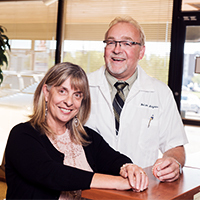 Your first visit to our office will last between 15-30 minutes, and up to 15 minutes for all subsequent visits. If you are having a partial denture made, we recommend a visit to your family dentist for a check-up/cleaning before your first appointment with us. This confirms your remaining teeth are healthy before we move ahead with constructing your denture, and it helps us avoid complications in the future. We readily accept insurance for those who are eligible! All of our insurance codes are standardized and recognized by all major insurance companies. However, we do ask that you advise us at your earliest appointment if you have insurance eligibility; doing this helps us follow proper procedures to ensure a smooth, stress-free process and optimal coverage. Please note that most insurance companies require a formal estimate for any work over $500.00. Your insurance company will specify directly and only with you what portion of our cost for services will be covered via an “explanation of benefits.” From this point onward, we are here and happy to help! If you are unsure of your entitlements or wish to learn more about the process of filing a claim, don’t hesitate to give us a call. After 30+ years in the industry, there is very little we can’t answer when it comes to dental insurance in Saskatchewan. Questions? Check our FAQ page! Please note: patients are seen by appointment only. Send us your questions and one of our team members will follow up with a personal response. Copyright Taylor Denture Clinic Ltd. 2016. All rights reserved.